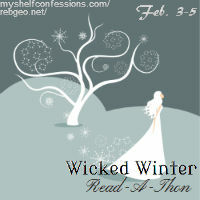 The Wicked Winter Read-a-Thon is hosted by the lovely April from My Shelf Confessions, and Bex from Kindle Fever. This is the second read-a-thon they've hosted. The first one was a few months ago (I want to say October?) and it was the first one I'd ever participated in. I met a ton of fantastic new bloggers, got a lot of reading done, and spent more time on Twitter than I ever have. It was a blast! 2:30pm - Finally getting started after spending the first part of the day with my older nephew, Noah. 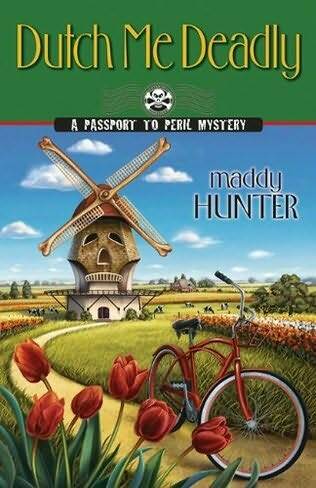 I'm reading an ebook, Near Death by MB Mulhall, and a paperback, Dutch Me Deadly by Maddy Hunter. We left THE BLACK ICE for the safety of a WINTER GARDEN. We spent the afternoon KISSING SNOWFLAKES, and when you put your lips on mine, your COLD KISS made me SHIVER. AFTER THE SNOW, surrounded by FROST and the FROZEN ground, you kissed me again. I'll never forget your COLD MAGIC. 6pm - Between getting a late start and my tendency to be distracted easily, I've only read 40 pages of Dutch Me Deadly, and 30 pages of Near Death. I never used to be able to read two books at the same time, but it helps that one's a hard copy and one's an ebook...plus they have very different story lines! I'm not sure exactly how much time I spent reading, because a lot of it was during commercials tonight while watching Vampire Dairies, CSI: NY, and Blue Bloods. I think I spent more time on Twitter than reading, but I had such a great time that I can't complain. You guys are freaking amazing! 10am - Challenge #1 for today is hosted by Kimberly at Kimba the Caffeinated Book Reviewer. For her challenge, we're all invited to the Wicked Winter Ball and we have to use book covers to show what dress we'd wear and who we would take as our date. And again, a lot of hot boys on covers, but I chose Prince Ash...look at those eyes! I'm heading out to my nephew Logan's birthday party in a bit (he's 2 today! ), so I won't get any reading done until tonight probably. See you guys later! Saturday wrap-up - Ok, so, I didn't get a whole lot of reading done today. By the time I got home from Logan's birthday party I was exhausted, and spent several hours vegged out in front of the TV before I had the brain power to read lol. I got 70 pages read in Dutch Me Deadly, and 15 pages read in Near Death, plus I participated in 2 of the 3 challenges. I'm hoping to finish at least one of my books tomorrow! 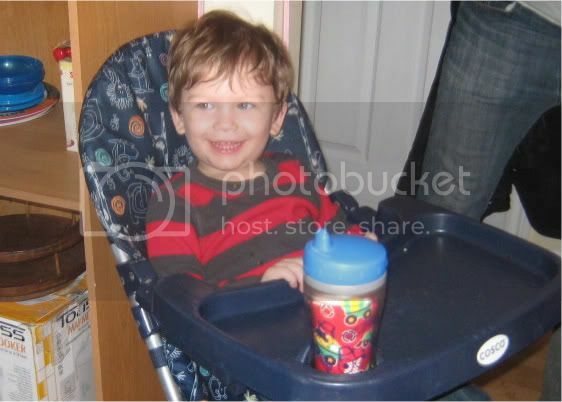 February 4th - Logan on his 2nd birthday! 12pm - Challenge #1 for today is hosted by Claire from Project To Be Read. The idea is to basically divide the book you're reading into thirds and take a 2-sentence teaser from each third. Pretty simple, right? My reading this weekend = giant FAIL. I had too much going on, and was too distracted to get much read. I ended up reading a total of 191 pages of Dutch Me Deadly, and 84 pages of Near Death. I'd been looking forward to this weekend so I could get caught up on my reading, but even though I didn't actually get a whole lot of reading done, I had a great time chatting on Twitter and participating in the challenge. A huge thank you to April and Bex for hosting this awesome read-a-thon, and to all the challenge hosts, and of course, all the participants who made it so much fun! You're all awesome, and I can't wait for the next read-a-thon! I haven't heard of either book, but I certainly hope you enjoy them. I'm currently reading Delirium by Lauren Oliver and Die For Me by Amy Plum. Have you gone and made your sentence for the Wintery Sentence challenge yet? :D I had fun with that! I've gotten better about being able to read 2 books at one, but it still bothers me sometimes. Great job on the 1st day! And on the challenge. you will look lovely in that dress with Prince Ash on your arm. Ohh! That dress is so gorgeous! And I've heard awesome things about the guys in the Iron Fey, so I'm sure you'll have an awesome date. ;) And awesome teaser too. Lol, love this. Hope you're having fun! Yay! We can't wait either. Only 3 months! \o/ I still think you managed to read a lot if you had lots of things going on. :) I managed to read more than the last RAT, LOL. Finish one half and starting another. ;) Woot. Hope to see you in the next one!